What an event it was, this year’s WoodenBoat Show at Mystic Seaport during this past weekend. We had three glorious days with weather much better than the weather guys promised in their forecast. I met some of the local rowing celebrities, but also some non-locals. Two different young ladies rowing teams came to visit the Rowing Hall of Fame, and they were amazed at the very nice wooden eight that hangs from the ceiling in the museum’s Visitor Center. Other non-local aquatic aficionados were Tom Weil of Woodbridge (CT) and Peter Mallory of San Diego (CA), two of America’s most well-known rowing historians, and Directors of Friends of Rowing History. Both gentlemen were working hard on their research at the Rowing Hall of Fame. Graeme King of Putney (VT), famous wooden boat builder - he once restored the eight in the Visitor Center - was visiting the Show together with two friends from Australia. I was also happy to see my dear friend Fred Roffe, who is maybe not an oarsman or a prominent historian within the field of rowing, but should be regarded as nobility within the rowing family. Fred is a descendant of the famous British professional rower and boat builder Harry Clasper. Very generously, some years back, Fred donated some “Clasper stuff” to the National Rowing Foundation. These Clasper memorabilia can now be viewed in the rowing exhibit “Let Her Run” (please click here). Furthermore, I had a short and pleasant chat with WoodenBoats Book publisher, Scot A. Bell, about Darryl Strickler’s coffee table book, Rowable Classics – Wooden Single Sculling Boats & Oars (2008). I had hopes that Strickler would be present at the Show, but unfortunately he was not. 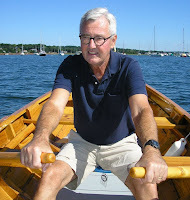 Right now, I am working on a little piece, a book review, for the Swedish rowing magazine, Svensk Rodd, about his book. I also had the great pleasure of talking to Steven Ferlauto, owner of Riverschoolboats. 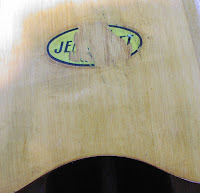 He showed me a “mystery boat”, which brand name "tag" regrettably was unreadable (please see photos). At my rowing club in Sweden, we had a lot of shells built by old famous boat builders in Europe: Sims in England, Pirsch in Germany, Karlisch in Germany, and Stämpfli in Switzerland, etc. But this single was a mystery to me. Is there anyone out there that has an inkling where this shell was built and by whom? 18th WoodenBoat Show coming soon! It is time again – for the WoodenBoat Show at Mystic Seaport Museum in Mystic, Connecticut. The 18th annual WoodenBoat Show will be held on 26, 27, and 28 June, and for sure there will be a lot for rowing history buffs to see and do. 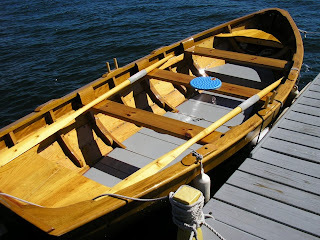 Of course, among the traditional classics and contemporary wooden boats you will find all kinds of oarpowered vessels. There will be close to 200 exhibitors all around the museum’s 17 acres. You will find more information about this great event and which exhibitors will be present by clicking here. 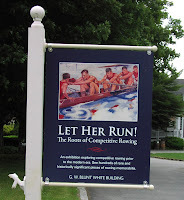 Do not forget to visit the National Rowing Hall of Fame and the rowing exhibit “Let Her Run” in the G. W. Blunt White Building (Exhibit building No. 54). The first thing you will see in the lobby if you look up is the wonderful wooden single scull By George, built by George Pocock in 1966 for the Olympic champion Duvall Hecht (1956 Coxless Pair). Hecht was so impressed by the shell’s beauty that he decided not to use her! Instead, he hanged By George up in his house, and bought a second-hand boat to scull in. 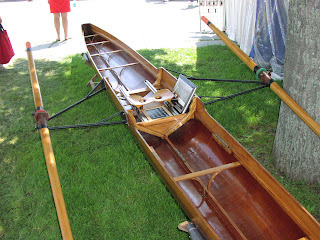 He later gave the shell to the National Rowing Foundation, NRF, who has donated it to Mystic Seaport Museum. Mystic Seaport Museum with the WoodenBoat Show will be open on 26, 27, and 28 June between 9:00 a.m. and 5:00 p.m. For museum admission prices, etc, please click here. The results for the 144th Harvard – Yale Race ended with a clean sweep for Harvard. The freshman race was more or less sealed after one of the Yale oarsmen caught a crab. Yale’s second varsity chased Harvard down the 3-mile course in a thrilling race, but fell short to pass them. Harvard won with a 20 second margin in the varsity eight. The rain stayed away during the races, but the Thames water was rough and the wind hard. Harvard has now won nine of the 10 last races in the varsity boat, and it was the 40th win for Head Coach Harry Parker. Not since 1999 have the races been rowed downstream, with the finish line just under the Gold Star Memorial Bridge. First, I had a problem finding my way down under the bridge on the New London side of the river, but after some turns here and there a parking area opened up. It was mostly Yale fans that had found their way to this spot on the shoreline. Among Yale oarsmen and their parents, brothers, sisters, and friends, I also caught a glimpse of rowing historian Tom Weil (Yale ’70) and local rowing celebrities. Weil wrote a very interesting history article about the Harvard - Yale Regatta programmes in this year's programme. The 144th Harvard – Yale Regatta is coming up this Saturday, June 13, on the Thames River, Connecticut. All three races - the 2-mile Freshman Race (at 2:30 p.m.), the 3-mile Second Varsity (at 3:15 p.m.), and the 4-mile Varsity (at 4:15) – will be held downstream and end at the Gold Star Bridge. Last year, Harvard won the Varsity race, 18:54.1, Yale’s time, 19:01.6. The previous year, 2007, Yale managed to pass their rivals when there were only 20 strokes to go. Harvard leads the overall battle with 89 victories against Yale’s 54. Yale’s head coach is John Pescatore, who was named head coach in 2002. Harvard’s head coach is, of course, still Harry Parker, who is in his 47th season as the head coach of Harvard heavyweight crew. To read more about the Harvard crew, please click here. To read more about the Yale crew, please click here. In my entry of June 1, I briefly mentioned Eric Phelps (to the left). Here is a little more about him and his famous brother, Ted Phelps (to the right, wearing his Thomas Doggett’s coat with the badge). 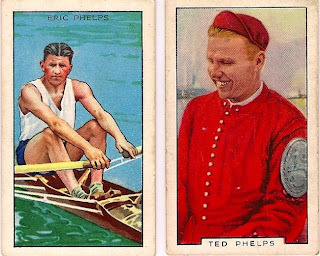 Of course, telling any story about the Phelps brothers, one should begin with their father, J. T. “Bossie” Phelps, who according to Hylton Cleaver, was the “last great professional coach, certainly so far as tideway rowing is concerned…”. Although, it seems Bossie Phelps was a magnificent rowing coach, he did not have any champion sculling title himself to back it up with; not that he actually needed one. He passed on his skills to his two sons, Ted, born in 1908, and Eric, born in 1912. When Bossie died at the age of 64, during the Second World War, he had seen both his sons become sculling champions. At the age of 18, Ted won the Newcastle Handicap, which at the time was the prime professional race in Northern England. Two years later, in 1928, Ted went to South America for a coaching job in Montevideo, but returned to London in 1930 to challenge Ernest Barry’s nephew, Bert Barry, for the World Sculling Championship title. Ted won the title, and three months later he entered the Thomas Doggett’s Coat and Badge Race, which is the oldest rowing race in the world, instigated by the Irish comedy actor Thomas Doggett, and sculled for the first time in 1715 on the Thames. Ted Phelps did not have a difficult time winning this race. 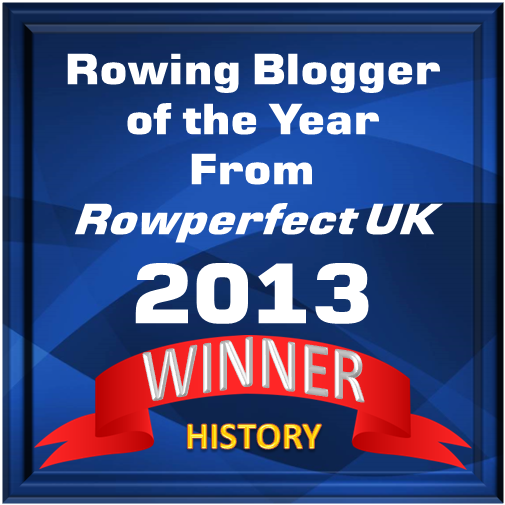 Normally, of course, winning Doggett’s coat and badge was a good start of your professional rowing career, where the height might have been to crown it with the world title. Here Ted did it in the reverse order, which was rare. Ted retained the world title against Bert Barry (seen on the left) later that year, and also kept it successfully against Major Goodsell of Australia in 1932. One year later, Ted lost the title to the Australian Bobby Pearce, who was living in Canada. In 1935, Ted Phelps raced against Bert Barry for the British Championship between Putney and Mortlake on the Thames. Ted won, but lost the title the next year to Bert’s brother, Lou Barry. As Bossie had forbidden Ted and Eric to race each other for a champion title, Eric, who had won the Thomas Doggett’s Coat and Badge Race in 1933, took the opportunity to challenge Lou Barry for the British title later in 1936. Eric was triumphant and beat Lou for the title. Half a year later they met for a return match, and again Eric came out on top. In 1935, Eric Phelps went to Germany to become a private coach to Georg von Opel. When the war broke out, he was interned. After the war had ended, Eric worked in Argentina as a coach for three years, between 1947 and 1950. Back in London, in 1950, a race between Eric Phelps and Eric Lupton (a Thomas Doggett Coat and Badge winner in 1947 for the postponed 1940 race) was set up in Frankfurt, Germany for a European Championship. Phelps won the title this time, but later lost it to Lupton, who became the last European Professional Champion. It is easy to find the house. It is the only house in Noank built of Scandinavian design – the other houses in the village carry the easily distinguished style of New England. I ring the door bell and soon Frederic Anderson, a friendly, tall, trim gentleman in his early seventies, opens the door and welcomes me. He is shortly joined by his Swedish-born wife, Anita. Frederic Anderson’s ancestors were, for generations, the owners of the Palmer Shipyard in Noank, the old, little fishing village located where the mouth of the Mystic River meets Fishers Island Sound in the southeast corner of Connecticut. Between 1827 and 1914 nearly 700 vessels were launched by the Palmers. The Andersons’ house is on the very site of the shipyard. Fondly remembering his boyhood years when he and his younger brother ‘Chip’ were messing about in boats on the Mystic River, Frederic – Freddy to his friends – keeps a boat docked at their house. In 2000, during a trip to Sweden, the Andersons saw an article about a boatbuilder, Roland Persson, and his small boatyard, Lilla Kålviks Båtbyggeri, on the island of Orust on the west coast of Sweden. 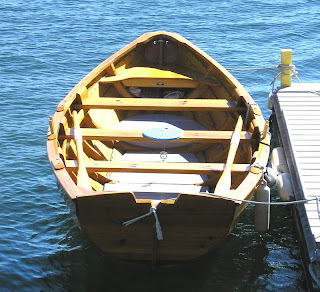 Later, they set out to visit the yard and found docked there an old local type of rowing boat, a Bohus eka – Bohuslän is a province on the west coast and an eka is traditionally built of oak (ek in Swedish). The Andersons were impressed by her graceful lines and Mr Persson’s description of her seaworthiness in the open waters of the North Sea. A year later, Anita and Freddy were back again, trying to order their own eka from Mr Persson. ‘He explained that he never built boats on commission,’ Freddy says and smiles. ‘Persson was only building boats he was inspired to build and, at the same time, following an old tradition not to use any boat plans.’ Before the Andersons left the yard, they expressed interest in buying the next boat that came from Persson’s hands. In 2002, on their yearly visit to the boatyard on Orust, the Andersons found an almost complete eka. Although beautiful, they had second thoughts because of her size and weight out of the water. However, after trying a boat that Persson had built a couple of years earlier, ‘she proved to be everything we wished for,’ Anita says. When they asked Persson how much he wanted in deposit for the boat, he said a handshake would do. The Andersons decided to name their boat after Anita’s mother, Göta. Almost finished, Göta was on display at the Gothenburg Boat Show in February 2003 where she was a great success. Later that autumn, the sad news reached the Andersons that Roland Persson had been killed in a car accident on Orust. The following July Anita and Freddy travelled back to Lilla Kålviks Båtbyggeri to arrange the shipping with Persson’s daughter Christina Andersson, who was now building boats together with her son, Johnny. The Andersons decided to use a small shipping company, Fallen & Lyrstrand Shipping AB, on the mainland of Bohuslän. Christina built a crate for Göta, which was shipped out from Göteborg. Freddy invites me to go on an outing with Göta. It is a warm, sunny day, and the busy traffic of pleasure boats on the river creates waves that make the eka bob gently up and down. She is beautifully varnished and the reflections of the sun in the water make her sparkle even more. I take the bow seat and, looking aft, see four shiny letters below the stern thwart: G-Ö-T-A. Oars in tholepins, we start to row upriver. 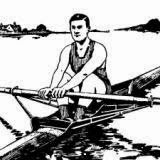 My rowing and sculling experience is from narrow racing shells with a sliding seat, but it does not take long before I am in the ‘swing’. A bit out from land the wind picks up and comes in from starboard, but that hardly upsets Göta at all. Freddy informs me that Göta is 13'9" long, 5'3" in the beam, and weighs 385lb. ‘A sturdy boat,’ he says proudly. Göta is well-balanced, easy to row and manoeuvre. During the almost two hours we are out on the river, she gets envious looks from passers-by as her robust Nordic design makes her a remarkable sight on the Mystic River. Göta is a beautiful boat that gives glory to her Swedish boatbuilder, Roland Persson; an appreciation that the old Palmers would have understood. This article was published in Maritime Life and Traditions, No. 32, Autumn 2006. A slightly longer version, in two parts, was published in the Swedish rowing magazine Svensk Rodd, No. 2 and 3, 2006. 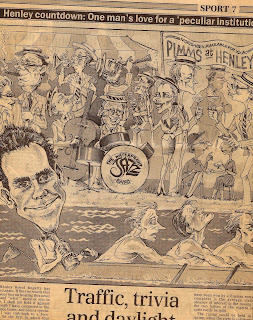 As I mentioned in an entry on May 31, the actor Hugh Laurie has published a funny article, “Traffic, trivia and daylight snobbery”, about the Henley Royal Regatta in The Sunday Telegraph on July 2, 1990. Here is the beginning of the article. “Well, Henley Royal Regatta has come round again. If the two words that spring to your lips on hearing this news are “so” and “what”, more or less in that order, I shall not hold it against you. Although I have competed in the Regatta three times, and been a spectator since I was cork-high to a Jeroboam, I’d be the first to admit that Henley is a very peculiar institution. The last time I raced at Henley was in 1980, in the final of the Silver Goblets. It was a very bad year to pick. The regatta had been overrun by the American Olympian squad who were looking to kick some sand into English faces after their boycott of the Moscow Games. With my partner, James Palmer, I squared up to two brothers by the name of Borscheldt, [sic M. & F. Borchelt] who were 19 feet tall and made entirely of Kevlar. Or maybe they were called Kevlar and made of Borscheldt, I can’t remember. Anyway, they were munching canapés on the flight back to Boston by the time we finished. Soon after that defeat I hung up my rowing trousers and beat my oar into a ploughshare, but to this day I cannot shake off a considerable fascination with Henley. It is, as I said, a very peculiar institution. But by golly it is a popular. Nowadays, something like half a million people visit it each year. You could explain this by saying that Henley is an important part of the ‘social calendar’, but how many of us own one of those, or would even know where to buy one?" Jack Wilson “had gone trek in the course of his duties, as District Commissioner. He came out of his tent after lunch one day and immediately felt a heavy blow in his back. Turning, he saw an old woman holding a spear. The blow had in fact been a spear thrust so savagely that it had nearly transfixed him. Having withdrawn it, the old woman struck again but missed, and as she made a third attempt Jack grabbed the shaft and disarmed her. The old woman had been put up to this attack on the District Commissioner by a witch doctor to rid herself of some misfortune.